A recent change to Apple’s App Store search engine now leads to improved search results for misspelled queries with small typos, we’ve learned. In addition, searchers looking for an app they know by name, but are unsure if it has spaces in the title, are also seeing better results. For example, those looking for the highly ranked “QuizUp” game wouldn’t have found it before if they had typed in “Quiz Up” with a space. Now it appears. Sources familiar with the matter confirm to us that these App Store search engine changes went into effect a few weeks ago. The improvements could lead to increased app downloads for affected developers, particularly those with hard-to-spell or lengthy titles, as many are only now beginning to realize. “That’s great news for app publishers and yet another step in Apple’s efforts to improve app discoverability,” says Craig Palli, Chief Strategy Officer at mobile app marketer Fiksu, who also confirmed these changes following our inquiry. The improvement is no small matter when it comes to pitting Apple’s App Store versus competitor Google Play, which has long since offered a spell checking function. For example, earlier this year, App Store SEO firm SearchMan had looked into the differences between the two platforms, and found that a simple misspelling of the word “calendar” (i.e., spelling it “calender”) led to 100 times more results in Google Play. It seems the only iOS apps returned were those who thought to include the misspelling as one of their keywords. The company had run through a handful of misspellings to further demonstrate this problem (see slide 8 here, and above), which showed how much better Google Play was at correcting for typos and poorly spelled words. SearchMan CEO Niren Hiro ran these same queries again for the date of November 24th, 2013 and found the results had definitely shifted, though not always for the better. (See chart below). In the case where a misspelling returned few results, like “newz” which had 9 hits or “camara” which had 862, there was a dramatic improvement. But he spotted something else, too: there appears to be a cap of roughly 2,220 results on the misspelled words right now, which is why you see that misspelled keywords like “shoping” and “pocker” are actually seeing fewer results than before. This is likely the result of the App Store now correcting for the misspelling instead of looking for the exact keyword match. Though the changes will lead some consumers to apps they may not have otherwise discovered, or at least get them there more quickly if they had made a “fat finger” mistake, they don’t really represent a large volume of App Store queries. In another test, George Lawrence, founder at App Store optimization firm Straply, pulled data for all the misspelled variations of the phrase “angry birds” on the iOS App Store, for example. The correct spelling drove 98.48% of searches, but no misspelled variation even generated one percent of search volume. 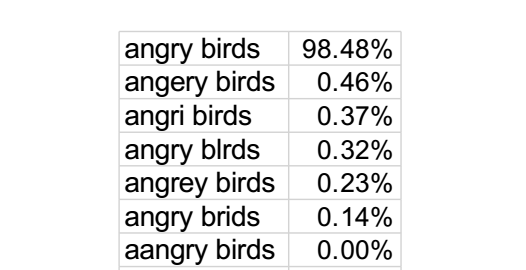 “Angery birds” was 0.46% of searches, “angri birds” was 0.37%, “angry blrds” was 0.32% of searches, and so on. There were only five misspelled variations that drove enough search volume to even rank, says Lawrence. Though misspellings may represent the long tail of App Store searches, correcting for these queries is an important feature for any search engine to offer, whether app search or otherwise. However, it’s clear that in search, as expected, Google has had the advantage here – it’s nearly 2014, and only now has Apple made this sort of basic feature live. Still, the improvements should be positively received by the majority of the iOS developer community, except of course for the App Store equivalent of a domain name squatter, who may have been erroneously benefitting from users’ typos and mistakes until now.